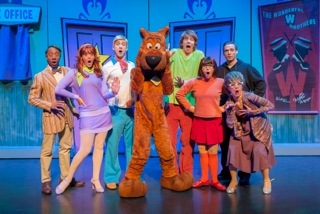 *WIN tickets to see SCOOBY-DOO LIVE! MUSICAL MYSTERIES with your family! My eldest son has only recently been introduced to Scooby-Doo, a show I was all too familiar with growing up. I love it how life comes full circle and how I am now able to share these memories with my own kids. I was SO excited to hear that the show is coming to South Africa for two reasons. Firstly, I love theatre and think it’s such a great way to bring a little bit of culture into the way we entertain our children. There’s is something so magical about a real life performance that opens up a child’s imagination in ways a television never could. The other reason is because I’m starting to realise that children value experiences and the making of memories. With christmas around the corner, many of us are under pressure to once again buy all the things we think our kids want. And while kids are kids and presents are always welcomed with excited eyes, I’ve realised that many kids just want to be with their parents and have quality time doing special things. They really value time over material gifts. Go figure! This is such a perfect opportunity to take them to see a show that the whole family will enjoy, a wonderful way to start the holidays and remind our children what the festive season is all about : Being together, being grateful for what we have and creating the most special memories of togetherness. Here’s what you may want to know about the show! SCOOBY-DOO LIVE! MUSICAL MYSTERIES , featuring everyone’s favourite characters from one of television’s longest-running animated series will be at the Big Top Arena at Carnival City in Johannesburg from 4 . 6 December, and at the Grand Arena, Grand West in Cape Town from 11 . 13 December. Tickets are on sale NOW at Computicket. Tickets in Johannesburg and Cape Town are priced from R 120 . R 290. In this exciting new production, Scooby-Doo and the Mystery Inc. Gang have been called upon to help solve an epic mystery. A trouble-making ghost is haunting a local theatre and Shaggy, Fred, Daphne, Velma, and Scooby-Doo are on their way in the Mystery Machine to crack the case. With crazy ghosts, perplexing puzzles, and an abundance of Scooby Snacks, it’s Scooby-Doo and friends at their best, travelling across South Africa this summer, solving mysteries wherever they go. SCOOBY-DOO LIVE! MUSICAL MYSTERIES features big musical numbers including the evergreen Scooby-Doo theme song, Scooby-Doo, Where Are You?, alongside original groovy tunes including Round Every Corner and We’re Mystery Inc.
SCOOBY-DOO LIVE! MUSICAL MYSTERIES, presented by Warner Bros, Life Like Touring, and Airey Scott Entertainment, in association with Boomerang and DStv. WOULD YOU LIKE TO WIN TICKETS??? Silly question I know! If you live in JHB ( or will be visiting on holiday) I am giving away 4 tickets valued at R160 each for you to enjoy with your family. The show will be at The Big Top Arena, Carnival City on Sunday, 6 December @ 10am. Follow these easy steps to stand a chance to WIN!!!! Comment on the blog with your kids ages! This competition is for JHB residents or for those travelling through the city at the time of the show. My decision is final and tickets will not be redeemed for cash. The mom diaries is not responsible for any loss or damages whatsoever. What about us in Cape Town? My kids are 3 and 4 years old. My daughter NichÃ© is 7.